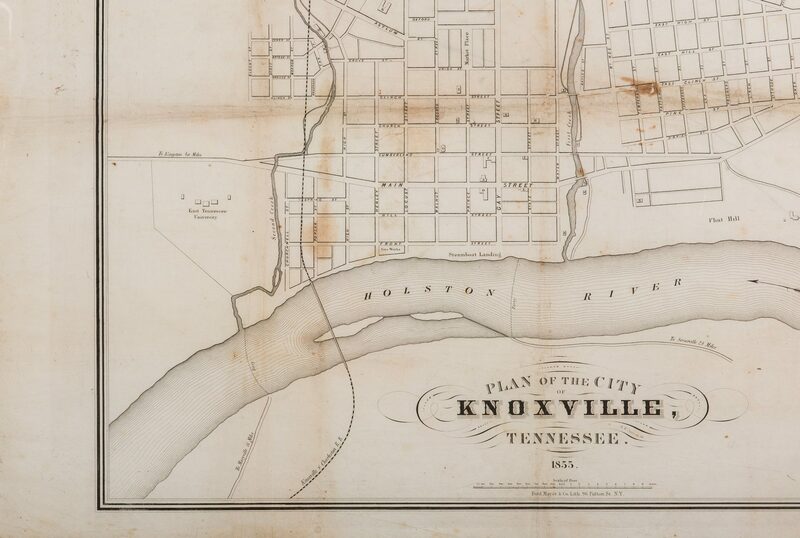 Scarce "Plan of the City of Knoxville, Tennessee" drawn by R. W. Patterson, surveyed and compiled under the direction of Albert Miller Lea, lithographed and published by Ferdinand Mayer and Company, New York, 1855. 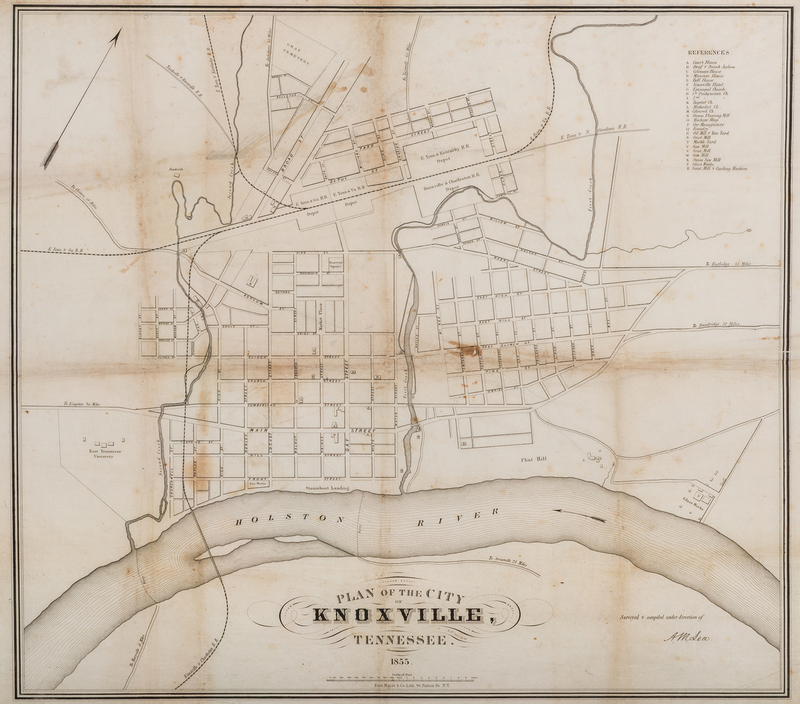 Rare map depicting the city of Knoxville, TN with streets, including Gay Street, railroads and railroad depots, including East Tennessee-Georgia and East Tennessee-Virginia Railroad, East Tennessee & Kentucky Railroad, and the Knoxville & Charleston Railroad, bodies of water, including the Holston River (later renamed the Tennessee River), roads with distances in miles to nearby towns, hills, and other points of interest, including the East Tennessee Cemetery, the Glass Works, and the Market Place (more commonly known as Market Square). 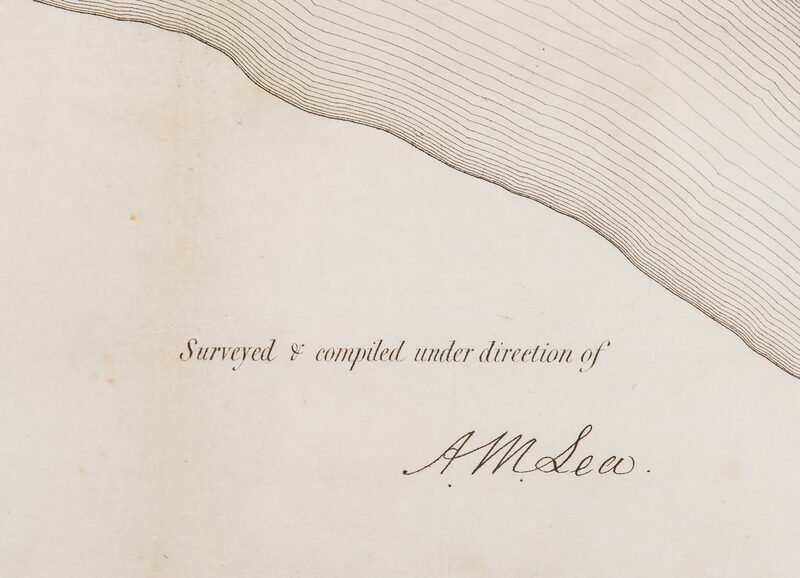 Title and scale of feet, centered below map, References, top right, directional arrows, top left and lower right. Map surrounded by a five line border. Housed in a plastic sleeve and mounted to corrugated fiberboard. Image – 23 1/4" H x 26 1/4" W. Sheet – 25 1/4" H x 31 3/4" W. Sleeve – 26 1/4" H x 32 3/4" W. Fiberboard – 30" H x 35 3/4" W. Biography: Albert Miller Lea (1808-1891) was born in Richland, Tennessee, a small village not far from Knoxville. He attended the United States Military Academy. He graduated fifth of 33 cadets in the Class of 1831. 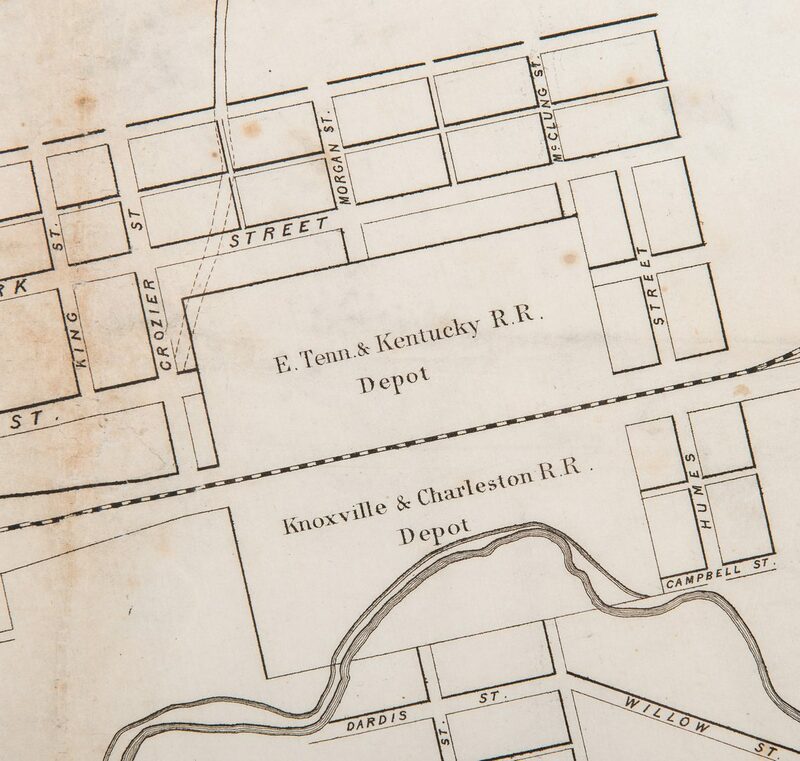 Due to his high class ranking, he was assigned to the engineers and posted to Fort Des Moines in the Iowa Territory, serving until his resignation in May 1836. 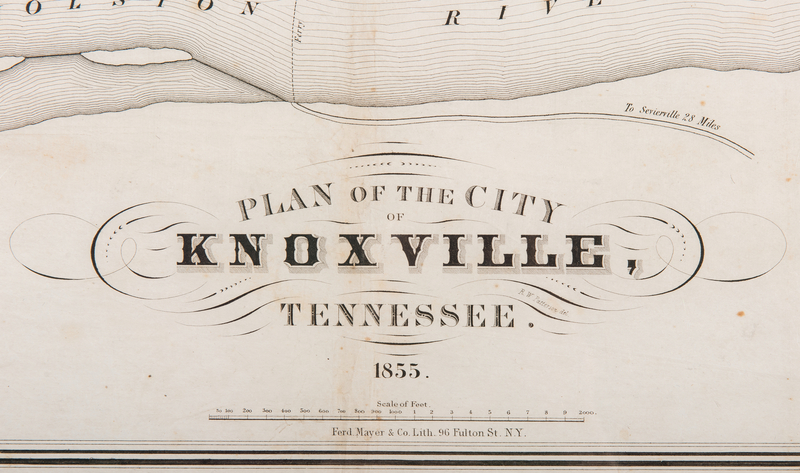 In 1837, despite his youth, he became the Chief Engineer for the state of Tennessee. 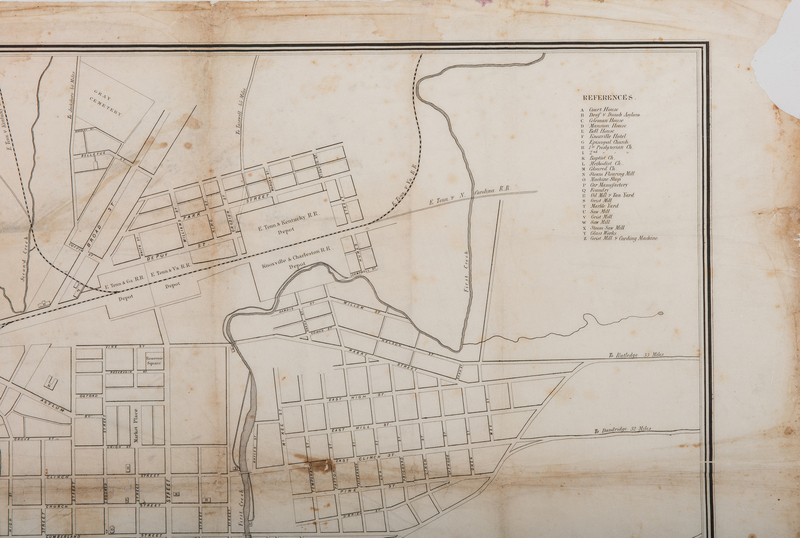 He then worked for the Federal government determining the boundary between Iowa and Missouri. From 1839 to 1840, he was an assistant engineer on the Baltimore and Ohio Railroad. He became a brigadier general in the Iowa militia and then the chief clerk for the U.S. War Department. 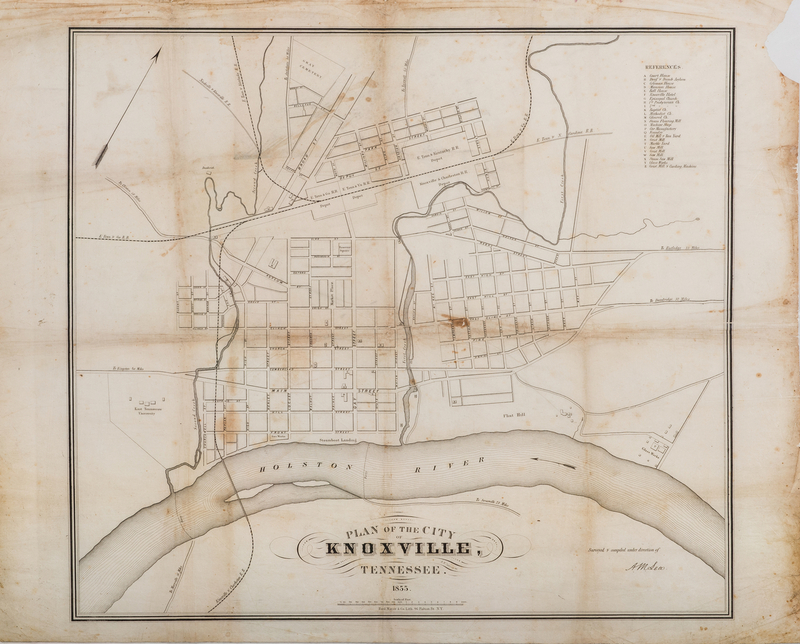 In 1844, he earned his master's degree in engineering from East Tennessee University in Knoxville and joined the faculty as an instructor. From 1849 to 1854, was the city engineer for Knoxville, as well as managing a local glass manufacturing company. 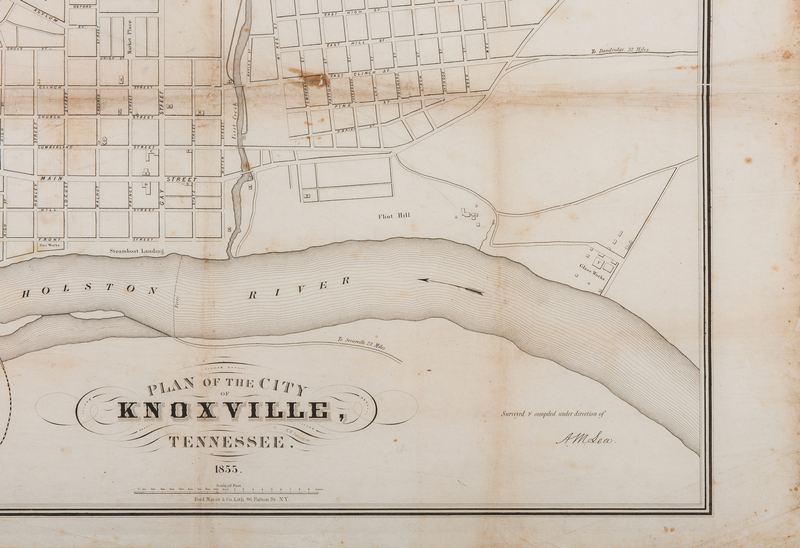 He moved to East Texas in 1855. 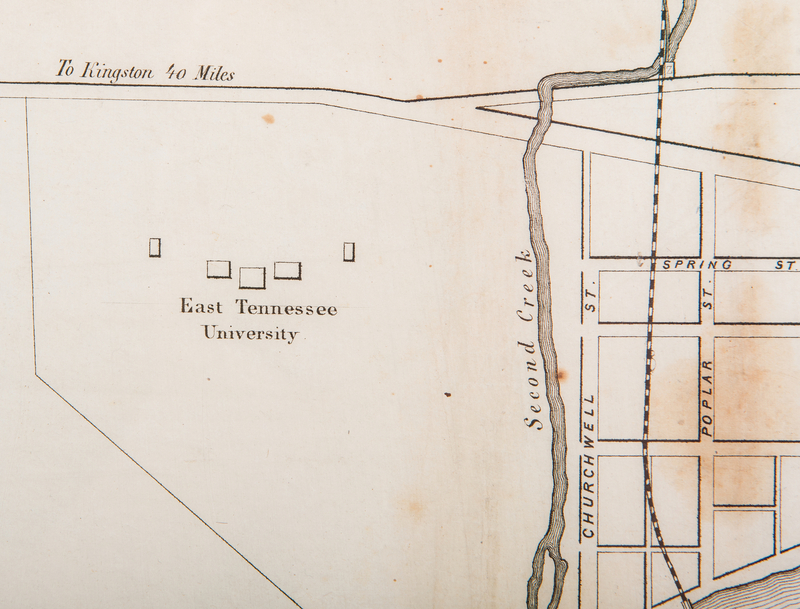 During the American Civil War, Lea was an engineering officer in the Confederate States Army with the rank of major (later, lieutenant colonel). 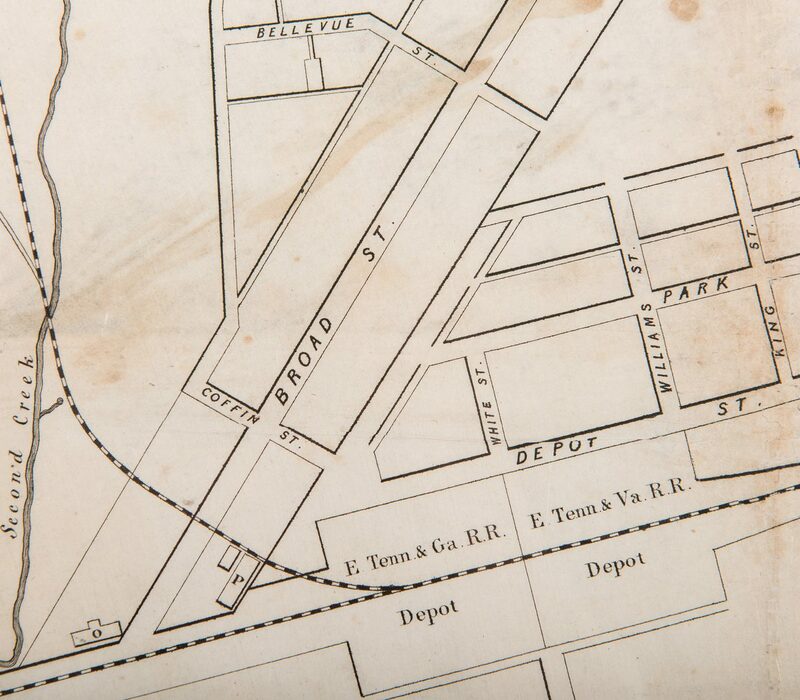 During the Battle of Galveston on New Year's Day 1863, his 25-year-old son, Lt. Commander Edward Lea of the Union Navy, was mortally wounded while serving on the USRC Harriet Lane. Lea himself was among the Confederate officers who boarded the captured ship, and found his son shortly before his death. After the war, Lea lived in Galveston for several years. 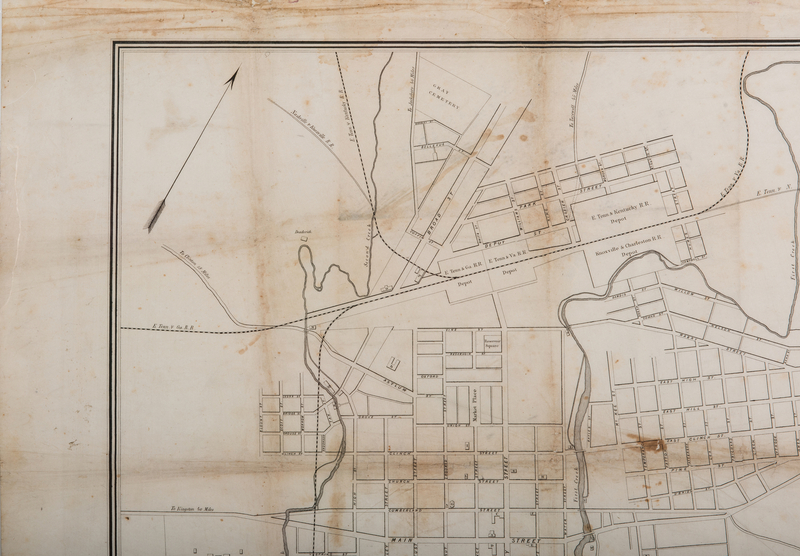 He moved in 1874 to Corsicana, Texas, where he purchased a farm. He died of heart failure in 1891 and was buried in Oakwood Cemetery in Corsicana. The City of Albert Lea, Minnesota, is named in his honor. 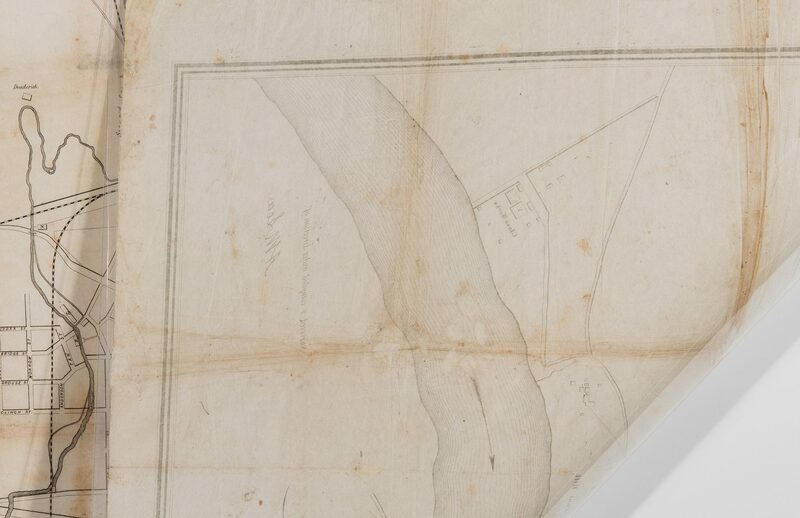 (For additional reading, see: "The Early Settlement of Albert Lea". Sequicentennial History. City of Albert Lea, and Upham, Warren (1920). Minnesota Geographic Names: Their Origin and Historic Significance. Minnesota Historical Society. 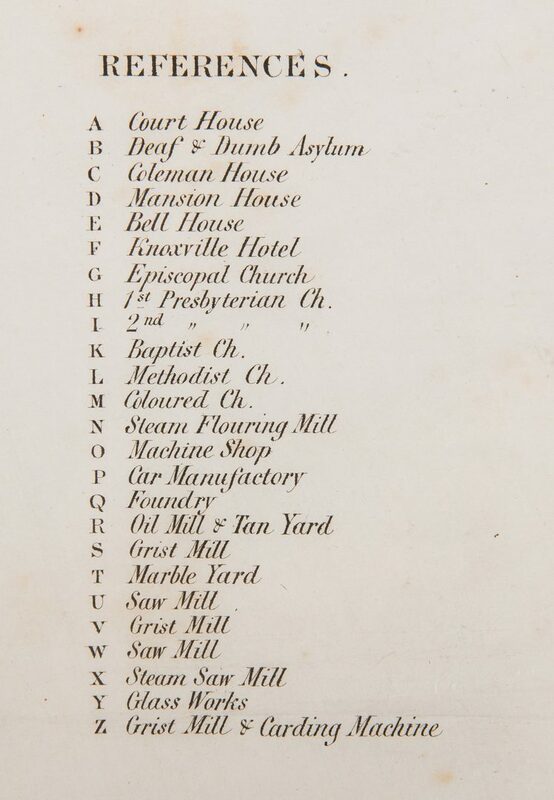 p. 198). 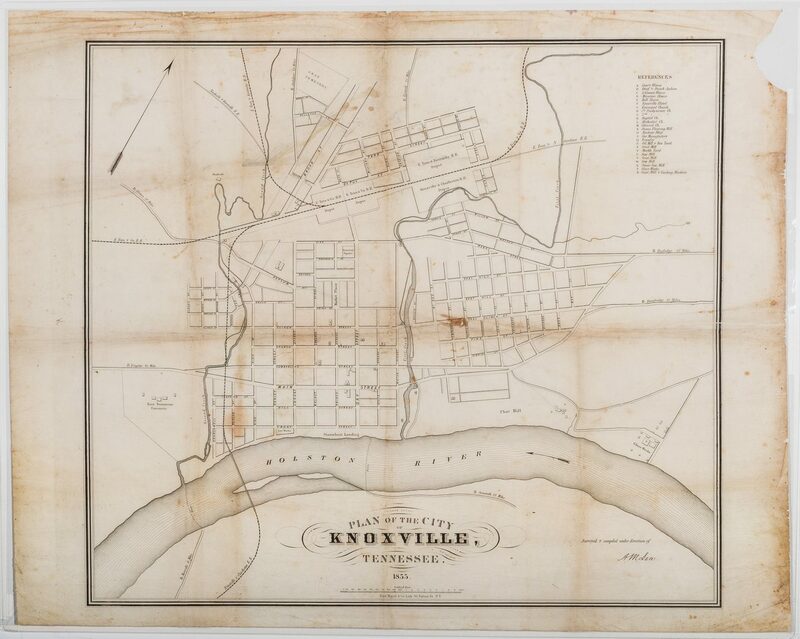 CONDITION: Overall good condition with foxing spots, largest 1/4", toning, creases, stains, largest 4" x 1", areas of loss, largest 3 1/2" x 1 1/2", visible to surface and en verso of map.